zeynali, M., Nazari, M., Karimi, S., Seyedmohaghegh, S., Soltani, S. (2017). Prediction of polyvinyl alcohol (PVOH) properties synthesized at various conditions by artificial neural networks technique. Iranian Journal of Chemical Engineering(IJChE), 14(2), 3-16. M.R zeynali; M. Nazari; S. Karimi; S. M. Seyedmohaghegh; S. Soltani. "Prediction of polyvinyl alcohol (PVOH) properties synthesized at various conditions by artificial neural networks technique". 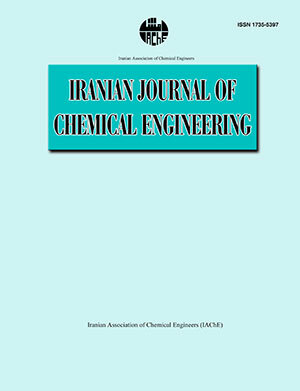 Iranian Journal of Chemical Engineering(IJChE), 14, 2, 2017, 3-16.
zeynali, M., Nazari, M., Karimi, S., Seyedmohaghegh, S., Soltani, S. (2017). 'Prediction of polyvinyl alcohol (PVOH) properties synthesized at various conditions by artificial neural networks technique', Iranian Journal of Chemical Engineering(IJChE), 14(2), pp. 3-16.
zeynali, M., Nazari, M., Karimi, S., Seyedmohaghegh, S., Soltani, S. Prediction of polyvinyl alcohol (PVOH) properties synthesized at various conditions by artificial neural networks technique. Iranian Journal of Chemical Engineering(IJChE), 2017; 14(2): 3-16. In this research samples of PVOH were synthesized at various reaction conditions (temperature, time, and amount of catalyst). First at 25˚C and 45˚C and constant catalyst weight samples of PVOH were prepared with different degree of hydrolysis at various times. For investigation of the effects of temperature, at times 20 and 40 min and constant weight of catalyst PVOH was prepared at various temperatures. Increasing the time and temperature of the hydrolysis reaction caused increasing degree of hydrolysis and reducing the molecular weight of the samples. Considering the variation of reaction condition, the effects of each parameter on molecular weight, degree of hydrolysis and conversion were investigated individually and also collective. Also, by an artificial neural network method, using experimental results (temperature, time and catalyst amount as input and conversion, degree of hydrolysis and molecular weight as output) a network by Levenberg-Marquardt (LM) back propagation with tan-sigmoid transfer function was established. Finally, the established model presented a good prediction capability and enabled us to predict the output in terms of arbitrary in puts. PVOH is an important polymer and prediction its properties during production significantly improves the quality of the products. Neural network technique is used to model the chemical processes to predict the behavior of the process. In this research we investigated the effects of various processing parameters on the properties of PVOH. Herrmann, W. O., Ger. Pat. DE450286, (1924). Sakurada, I., USA Pat. 147958, Poly (Vinyl Alcohol), (1942). Finch, C. A., Poly vinyl alcohol properties and applications, 1st ed., John Wiley, New York, (1992). Kokabi, M., Sirousazar, M. and Hassan, Z. M., “PVA-Clay nanocomposite hydrogels for wound dressing”, Eur. Polym. J., 43,773, (2007). Brandrup, J., Immergut, E. H., Grulke, E. A., Abe, A. and Bloch, D. R., Polymer handbook, 4th ed., John Wiley and Sons, New York, (2005). Leja, K. and Lewandowicz, G., “Polymer biodegradation and biodegradable polymers, A Review”, Polish J. of Environ. Stud., 19, 255, (2010). Lindermann, M. K. and Tanner, C. S., “Vinyl alcohol polymers”, in EPST 1st ed., 4, 149, (2012). Lyoo, W. S., Han, S. S. and Choi, J. H., “Preparation of high molecular weight poly(vinyl alcohol) with high yield using low-temperature solution poly-merization of vinyl acetate”, J. Appl. Polym. Sci., 80, 1003, (2001). Soltani, S., Asempour, H. and Jamshidi, H., “Investiation of reaction conditions for preparation of medium molecular weight poly(vinyl alcohol) as emulsifier”, IPJ, 16, 439, (2007). Saunders, K. J., Organic polymer chemistry, An introduction to the organic chemistry of adhesives, fibers, paints, plastics, and rubbers, Chapman and Hall LTD., London, p. 404, (1973). Harris, H. E. and Pritchard, J. G., “Determination of 1,2- Glycol units in polyvinyl alcohol”, J. Polymer Sci., 2, 3673, (1964). http://www.sekisui-sc.com/www.celvol.com, Sekisui specialty chemicals, U.S. Accessed, 19 April 2014. Lindemann, M. K., Vol. 1: Mechanism of vinyl acetate polymerization, Dekker, New York, (1967). Navarchian, M. H. and Mousazadeh, S., “The effects of reaction variables on solution polymerization of vinyl acetate and molecular weight of poly (vinyl alcohol) using taguchi experimental design”, IPJ, 22, 341, (2010). Jayabal, S., Balaji, N., Rajamuneeswaran, N. and Amprasath, R., “Artiﬁcial neural network modeling of mechanical properties of calcium carbonate impregnated coir-polyester composites”. Trans, Indian Inst. Met., 66 (3), 247, (2013). Chowdhury, S., Das Saha, P. and Chakraborty, S., “Removal of crystal violet from aqueous solution by adsorption onto egg shells: Equilibrium, kinetics, thermodynamics and artiﬁcial neural network modeling”, Waste Biomass Valor, DOI: 10.1007/s12649-0129139-1, (2012). Noel, S., Quiming, N., Denola, N., Samsuri, S., Saito, Y. and Jinno, K., “Development of retention prediction models for adrenoreceptor agonists and antagonists on a polyvinyl alcohol-bonded stationary phase in hydrophilic interaction chromatography”, J. Sep. Sci., 31, 1537, (2008). Yazdi, E. S., Almodarresi, E., Mokhtari, J., Almodarresi, S., Nouri, M. and Naderi, A. A., “Scanner based neural network technique for color matching of dyed cotton with reactive dye”, Fibers and Polymers, 14, 1196, (2013). Youseﬁ, F. F. and Karimi, H., “Application of equation of state and artiﬁcial neural network to prediction of volumetric properties of polymer melts.” J. Ind. Eng. Chem. , 19, 498, (2013). Testing methods for poly vinyl alcohol, JIS Handbook, JIS K6726, (1994). Burnett, G. M., George, M. H. and Melville, H. W., “Polymerization of vinyl acetate at low temperatures”, J. Polym. Sci., 16, 31, (1995). Wheeler, O. L., Ernst, S. L. and Crozier, R. N., “Molecular weight degradation of polyvinyl acetate on hydrolysis”, J. Polym. Sci., 4, 409, (2003). Thomas, J., Obert, M., Pinschmidt, K. and Vanderhoff, J., “Grafting reactions of vinyl acetate onto poly[(vinyl alcohol)-co-(vinyl acetate)]”, Polym. Sci., 34, 2581, (1996). Golzar, K. and Modarress, H., “Prediction of the solubility of CO2 and N2 in common polymers”, Measurement, 46, 4206, (2013).